Dunkirk Review: The World War II Epic Rivets — As Does Harry Styles! Dunkirk isn’t a movie you just catch. Dunkirk is a fully immersive cinematic experience. On the 70mm IMAX screen, the rush of cold open water leaves you shivering. A nosediving fighter plane causes you to gasp for air. An explosion makes you want to duck for cover. And that’s the first 10 minutes. What else would you expect from director Christopher Nolan? Even when The Dark Knight trilogy and Inception auteur crafts a rare miss (cough, Interstellar), he takes ambitious risks. Nolan plays with mind-bending time and space elements with the same ease that a 4-year-old plays with a Fidget Spinner. What a relief that for his highly anticipated first historical project — a war drama that depicts the heroic rescue efforts of 400,000 troops off the Dunkirk beaches in May 1940 — he adds his signature thrilling touch. The mission is to safely evacuate the trapped British army along with French, Belgian and Canadian troops. Enemy forces have them surrounded. Prime minister Winston Churchill requests 30,000 survivors; one Naval commander (Kenneth Branagh) aims for more. Large British ships can’t veer close to the shore due to shallow waters, so the military calls out to small civilian-manned boats for assistance. The rescue attempts take place via land (i.e., they attempt to harbor on an 8-foot-wide pier called a “mole”) over the course of a week, via the sea in a day and via air in an hour. Only Nolan would dare to seamlessly weave three intercutting stories over three separate time frames. And he does it in heart-stopping fashion. 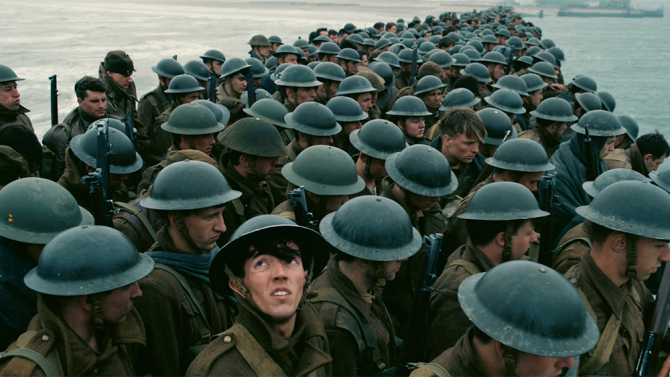 Amid a cast of thousands, Nolan hones in on a handful of soldiers and their respective journeys. Fresh-faced Tommy (Finn Whitehead) narrowly escapes enemy gunfire in the opening moments, only to end up stranded. 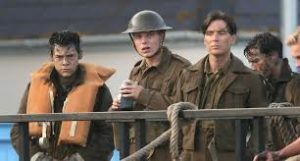 He encounters Gibson (Aneurin Barnard), and the two quickly realize the only surefire way to board a red-cross ship headed toward the mole is to carry a stretcher. On the mole, they meet a mistrustful solider named Alex (Harry Styles). FYI, I had to do an IMDB search to confirm these character names. Their personalities are barely indecipherable from one another. This development may frustrate those hoping for individualized introspection; the lack of distinction didn’t bother me. Cillian Murphy’s soldier doesn’t even have a name. But his struggle deeply compels. A soft-spoken British man (Mark Rylance) steering a civilian boat named the Moonstone finds him dangling from a torpedoed ship, barely alive. Using every ounce of energy, the survivor jumps to his rescue. On board, he’s too shell-shocked to talk. The traumatized silence turns to anger upon learning that the Moonstone is headed straight back to Dunkirk. Certain that the mission is a literal dead end, the “Shivering Soldier” lashes out at his own savior, as well as the man’s innocent teen son and his friend. That’s what war does to do a man. The whoosh of multi-tiered action can seem overwhelming. That’s the point. A massively tense rescue operation isn’t supposed to be streamlined. In the frenzied quest to live, there’s no time for introductions and idle chit-chat. In fact, dialogue is at a premium: Much of the film is a mesmerizing sonic symphony of bullet sprays, explosions, loud engines, wave crashes and desperate shouts. Hans Zimmer’s haunting score fills in the audio blanks. Nolan intricately recreates the arresting drama without the use of CGI or green screen crutches — and for all the violence, he restrains himself from showing gratuitous bloodshed. (Contrast this decision with Mel Gibson‘s Hacksaw Ridge. That World War II movie seemed to revel in its gore.) The labor it takes to create an authentic yet highly stylized war epic is visible on every inch of the screen. What an achievement. For 106 incredibly taut minutes, escape is futile. Just like the men stranded at sea, securing salvation doesn’t come easy. It must be earned. Go earn it. (Dunkirk opens Friday, July 21).